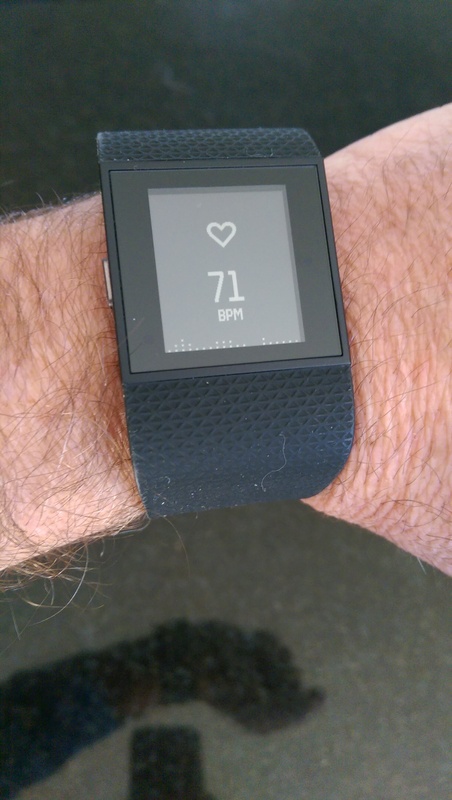 This is the first part of several posts on my time with Fitbit’s Surge super fitness watch. For this one, I pretty much just talk about the watch. It’s amazing how one image can convey so much information about what’s happened during one week. 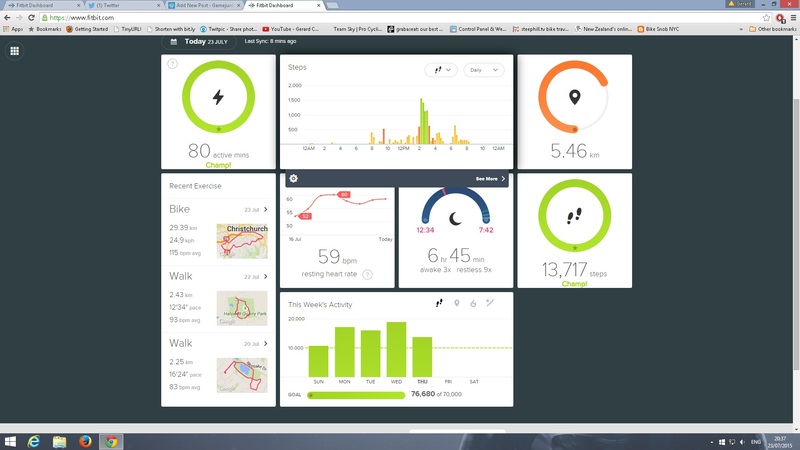 The image above is a screen grab of my Fitbit dashboard and its tells me – and now you if you click on it (you’ll also see what other tabs I’ve got open) – how active I’ve been over the past week, thanks to Fitbit’s Surge Super Fitness Watch (hence forth just to be called Surge). See the green circle at the top left with the black lightning bolt in it? That’s congratulating me on doing 80 minutes of exercise today (at time of writing, July 23). Underneath the “How much exercise minutes I’ve done” graph are little Google Maps icons showing the places I’ve travelled so far during a week of bike rides and walks. That bar graph next to it? With all the different coloured bars? That’s telling me how many steps I’ve taken during the day. If I hover over each bar I can find out how many steps I took each hour. The dashboard tells me that I should be aiming for 70,000 steps a week – 10,000 a day: As of Thursday night, July 23 I’ve managed 73,369. I’ve only had the Surge for one week and already I can’t live without it. It’s replaced my LG Smart Watch, too (at least for the time being) and I’m just amazed at the plethora of information that the Surge gives me about my sleep and how active I am during the day. It’s on my wrist 24.7 (apart from when it needs charging). I’ve always tried to keep fit: Riding my bike as many times during the week as work and family commitments allow, walking with my wife during the weekends and talking the dog for a walk most days. When I bought an HTC One M8 phone earlier this year it had Fitbit software pre-installed and I was fascinated at how many steps I could walk during a typical day. My current part-time job can involve a lot of walking, depending on the job I’m doing that day, and I started using the Fitbit software to compare days, seeing which days I was most active and which days I needed to up the activity. 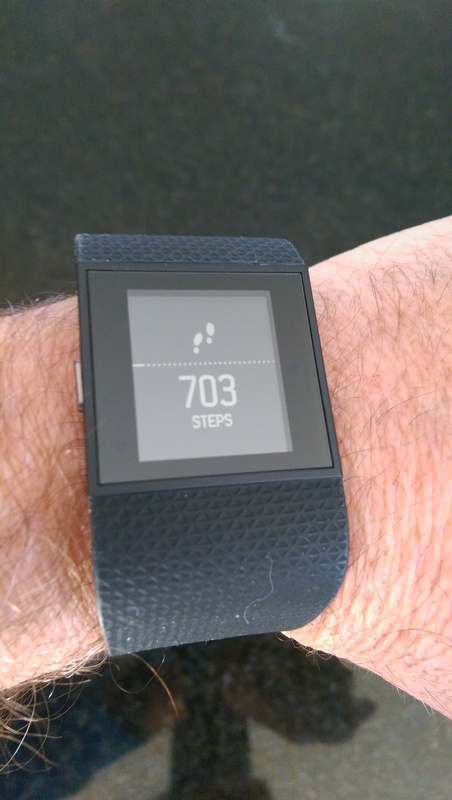 So when I was offered a Fitbit Surge to review, I jumped at the chance. I’m going to do this review over a few posts, too: There’s just too much for one post. The watch itself has an active backlit OLED touch screen, a nice flexible rubber strap and three buttons: One on the left, two on the right. It’s quite chunky, though, and on the back is a USB charging port (but it’s not a standard USB fitting) and the optical Heart Rate monitor, which continuously scans your heart rate using two (safe) green LEDS which measure your heart rate by detecting blood flow and capillary size changes under pressure. It’s all very technical but it’s nice to see a sports heart rate monitor that doesn’t force you to wear a chest strap. (As a comparison of the HR monitors, my LG Smart Watch has an HR function which I find next to useless: I have constant trouble trying to read my HR with it). 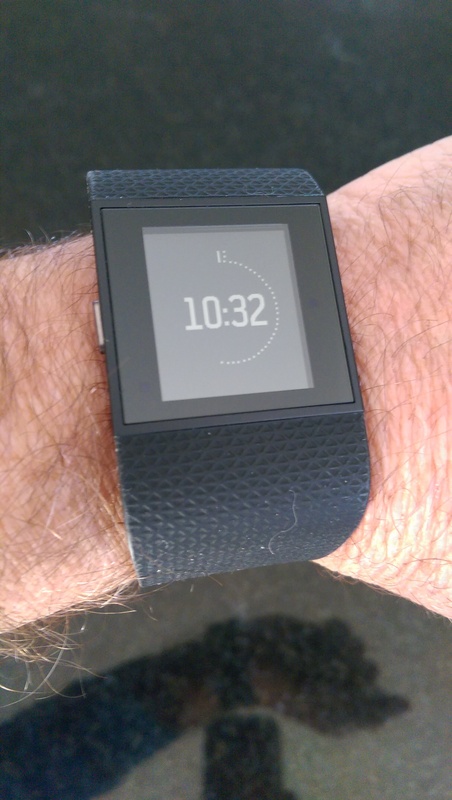 One of the several watch faces you can pick on the Fitbit Surge. The step counter shows how many steps you’ve done in a day. The Fitbit Surge has a continuous optical Heart Rate monitor. The Surge measures all the things you’d expect a fitness watch to: Calories burned, steps, distance and heart rate, as well as the number of floors you’ve travelled. You can access all those metrics by swiping the screen. The data can be synchronised to your smartphone where you can see things in more details (and in colour: the Surge’s screen is monochromatic). I found that I got a few steps when I did simple things like move my wrist to pick something up so while you might find a few extra steps at the end of the day, I found the Surge to be accurate. You also get a nice notification when you’ve reached 10,000 steps for the day. I found the watch comfortable to wear – the rubber strap is soft and flexible – but you have to make sure that it’s not too loose otherwise the HR won’t be able to get an accurate reading. Another useful function is that you can track your sleep with the Surge and it will breakdown how many hours you got and how many times you were restless or awake. Fitbit touts that the Surge has a battery life of five to six days but I found that using the GPS functionality every day meant that I was getting around three to four days on a single charge. That’s still good, in my book. It comes with a wireless dongle that plugs into a USB port on your computer so you can sync the data from your watch easily. As I said, I’m wearing the Surge pretty much 24/7 and am so far really impressed with what it’s capable of. I’ve used it for several bike rides and walks but more on that in another post. OK, that’s it for this post, in the next one I’ll go into more detail about how the watch handles strenuous exercise and go more indepth about what all the graphs mean.